My fascination is also fed by the leftover learning from the singular course in ancient Greek that I survived during seminary. 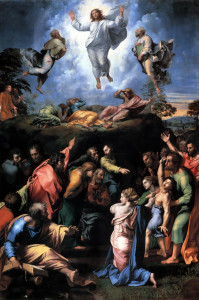 In the ninth chapter of Luke (along with Mark 9:2-8 and Matthew 17:1-8), the Gospel reader “views” Jesus’ sublime transfiguration on a mountain. This was witnessed by the inner circle of disciples, was likely a parallel (literally, metaphorically, or both) to Moses’ mountaintop moment with the Holy in Exodus 34:29-35, and included God’s blessing on Jesus’ ministry. But enough about that life-altering and transcendent event! Afterwards, Jesus hiked down the mountain, back into the mess and stress of humanity. While Peter, James, and John’s souls were still awhirl from the transfiguration (and their soles probably ached from pounding along a rocky trail), a stranger buttonholed Jesus. The stranger was more importantly a father, begging the Nazarene to heal his son. If you take the Bible literally, his son was possessed by a demon. If you read the Bible contextually, it’s likely a minor or major illness caused the seizures. Regardless of scriptural interpretations, the kid was sick, the father desperate, and Jesus soon healed the lad. Before approaching the recently transfigured Son of God, the father had apparently sought out Jesus’ disciples to heal his son. In my recent reading—and maybe for the first time—I wondered: which of the disciples had the father gone to see? Had the father first targeted one of the nine disciples that hadn’t accompanied Jesus to the mountain? Had those nine lingered at the trailhead, waiting for the return of Peter, John, and James? Or were they loitering at a Starbucks in a nearby village? Perhaps the fretful father had pleaded with them, one by one. Did the disciples have an excuse like . . . Jesus does the healings, I just watch. Or had they belittled the father . . . Clearly you and your kid don’t have enough belief, or touching his forehead and yelling for the demon to depart would’ve worked. Then again, maybe the father didn’t seek the nine remaining on the bench while the first string followed Jesus. What if the father, spying the returning Peter, James, and John, hurried toward them with his fervent hopes? But the terrific trio was tired or cranky. Perhaps each attempted to help, but failed. Or does this story have a modern twist? In Luke’s tale of one or more disciple’s failure, should I insert myself into the story? Am I a disciple who’d also disappoint? And I can’t resist wondering, when gazing at these verses with my new old eyes, was it that the disciples couldn’t help or wouldn’t help? 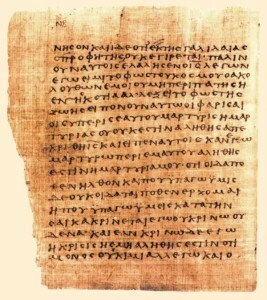 Papyrus 66, a codex of John’s Gospel from about AD 200. The text begins in the middle of the word εραυνησον (“search”) in John 7:52. You faithless and crooked generation, how long will I be with you and put up with you? Did Jesus yell or accuse or even belittle? Should there be a question mark, exclamation point . . . or neither? Today, I choose that Jesus whispered. After all, he’d just had that mountaintop experience. Wasn’t he in a good mood? And let’s not insert a question mark to end the sentence. Today, I think it was a melancholy statement, muttered only loud enough for those who needed to hear it. I’m a crooked disciple. I didn’t go up the mountain with the first string. I didn’t stay below, loitering in a village. And yet I’m the mostly faithless guy who can help the father. How? I’ve never healed anyone. What did all those other disciples—the ones on the mountain or in the village—do when the father approached them? I think they turned away from the father. 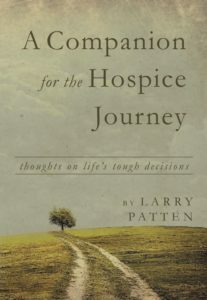 As I’ve shared before, I work at a hospice. Much of my time is spent checking on families after a beloved’s death. I made a recent call near the end of the workday. Frankly, I was hoping the person wouldn’t answer and I could leave a message or call back later. Why? I had to get home. We are nursing a post-surgery puppy and she can’t be left alone for long. But I called. It’s my job. The brother* of a woman who’d just died answered the phone. 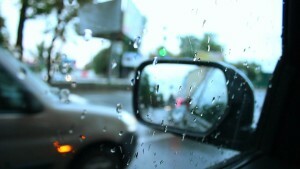 He was driving on rainy day and had to maneuver to the side of the road to safely talk. And talk and talk he did: complaining about siblings who refused to help their dying sister, criticizing Medicare’s lack of benefits, and giving me an “organ recital” about his own health problems. Passing traffic thundered in the background. I listened. Rain splattered against his vehicle. I listened. The cell phone signal was sketchy. I listened. I wanted to go home and tend to my dog. But I listened. I’ve failed other people a hundred times to the one time I’ve helped. I am a crooked disciple. Did the man whose sister had just died feel “healed” as he steered back onto the road? I can’t say. But his thanks sounded authentic, heartfelt. And, yes, my dog was okay when I finally got home. I believe Jesus, exhausted or exhilarated, the day’s work over or just starting, turned toward a father with a sick child. Jesus stood by him. Jesus listened to him. Jesus healed the son. And, in a sense, he also healed the father. Such a huge difference there is, between turning toward and turning away from a fellow traveler . . .
*Yeah, to protect confidentiality, I changed some of the “facts” from this call . . .
Nice. I am sure based on all my ‘curbside moments’ reading your posts and digesting your words, that I can’t possibly be the only one who is ‘cured’ by you in both big and small ways. Several years ago, I was at a church potluck. A former member of our congregation was visiting after many years away. She’d moved when her job transferred her. She has recently retired and wanted to catch up with her friends. The potluck was a fortuitous opportunity for everyone to greet and chat with her. She had been an active and generous member and greatly missed. My children were very young when she was a member so I’d spent those years that she was active chasing my kids and tending to their needs while trying to squeeze in a little joy for myself. One of my real loves is reading and when my children were small, novels were a lost cause. I started reading short stories and I loved reading the morning paper so I started reading them out loud while my kids played or ate. She sat down at the table as I was finishing my lunch, placed her hand on mine and thanked me for all of my help. My mind reeled as I tried to remember when I had been so helpful. She and I had only talked at length a few times. She must have read my facial expression because she followed that with an explanation. This woman, was a single mom so her personal time was almost nonexistent. She’d used my me-time reading technique with her child and she said it had created for them, a wonderful bond. She said she wanted me to know that every time she read the paper, she thought of me and was grateful. I had no idea. I thanked her for sharing, decided that was not enough and insisted on a hug too. I got her address and promised to keep in touch. A few weeks later I sent her a note of thanks and the hope that I would see her again soon. A month passed and then I received a note from her now adult child thanking me for writing. She’d passed away peacefully after a long illness. I am so grateful to her for taking the time to tell me that something I had shared had made a difference. I try to remember that and pass it forward in her memory and because it is what God has asked us to do. Thanks so much for sharing this. Oh that we all take the time to thank others. Sometimes, we race through this hurly-burly world and feel like we barely manage to survive. We “forget” our small acts of generosity make a huge difference for others. We are “blind” to how our choices can positively encourage another. I’m so glad this former member set aside a few moments to share her memories of you and her ongoing gratitude for you.